Residential, Commercial, Storm Damage Roofing Insurance Claims, Skylights & Exterior Remodeling. Full roof replacements & roof repairs. Call to find out what solution works best for you. "Talk to a local roofer today!" At DFW BEST ROOFING, we know its tough to choose a roofing contractor. Let us make it easier, simply give us a call, and we will answer all your questions. We believe in educating the customer, not pushing a sale. Finding reliable roofers to work with is never easy. This company strives to provide all clients with a powerful degree of trust and reliability. The group makes sure to handle all projects as carefully and efficiently as possible. Every roofer that works with the company is fully licensed and certified. All of the work that they perform is insured in order to help customers feel at ease. Clients will know that their home is in good hands when they call this company. The roofers take their time with every job, no matter how extensive it may be. They make sure that every step is completed correctly before they move on to the next one, guaranteeing that every installation is performed to the best of their abilities. The roofers that work with this group hold themselves to the highest standards when it comes to performing their work. The company prides itself in its versatility, helping its clients with all types of jobs and procedures, including general repairs, replacements and new system installations. The experts that work with this group are extremely courteous. If clients are not sure what a certain procedure will entail, the professionals will be more than happy to walk their clients through the process, helping them understand the work that is being done. All of the services are competitively priced to provide interested customers with plenty of options when it comes to finding the roofing service that they have always been looking for. All materials chosen for installations are of the highest quality. The experts always utilize high quality shingles and fasteners to make sure that the job lasts as long as it is needed. The roof repair, replacement or installation of your roofing system or exterior design deserves to be completed by a professional contractor with experience and proven results. At DFW Best Roofing you'll get exactly that. Our professional roofers who were awarded the Houzz 2015 & 2016 customer care reward (Click here to see), our roofers are expert field consultants who go above and beyond to provide customers with exemplary services. This is because when you call us you will talk to a roofer not a salesperson. We serve the entire DFW Area... a 100 mile radius of Dallas Roofing and Fort Worth Roofing; thus the name of DFW Roofing at Its best. Click Here for more information on the areas we serve. At DFW Best Roofing, we realize there are plenty of roofing companies to choose from, but you'll see that your other choices are really no choice at all. As a privately held and a two family owned DFW company, we hold ourselves to a higher standard. Our focus is to separate ourselves by redefining the entire re-roofing experience and bringing quality to a whole new level. "Written Workmanship Warranty" we'll be around to service your roof for years to come. After all, our roof not only protects our largest financial investment, but it's also protecting our largest personal investment. Whether you have an insurance claim, not sure if you should file one, or just plain need a new roof, we can help! We take credit cards for roof repairs, we even offer financing for your roofing, siding, concrete, or any or any other exterior project. We have the roofers on staff to give you the answers you need! We have undergone extensive training to identify and diagnose roofing damages and defects. We are NOT your typical roofing company. We will come out and identify the problems and/or damages on your roof. Call one of our roofers (not a sales guy) today to get the answers you need. Not only will we be able to provide you with the answers, but if you have a claim or need to file one, we can guide you through the process from start to finish with ease. By choosing THE roofing company with the most respected inspection track record you are able to rest assured you won't be misguided by a salesman just out there to sell you a roof at any cost. Whether your roof is in need of repair or replacement, you can rest assured you are in good hands. We use the highest quality materials, backed by some of the best labor and material warranties in the business. Our quality craftsmen have been put through extensive training to keep up with the latest industry standards and trends. If you are looking to replace your roof or in need of roof repair, give DFW Best Roofing a call for a free no hassle estimate (Sometimes can even give a quote v. We will present you with numerous options and styles of shingles to choose from. We are more than happy to address your questions and concerns. We are dedicated to being Dallas Fort Worth Metroplex's best roofing company for years to come. DFW Best Roofing promises to beat any bid by 5%. To provide the highest quality workmanship, using the industries finest materials. DFW Best Roofing will provide homeowners and businesses with our own outstanding labor warranty. 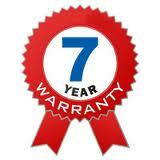 Our labor warranty is 7 years. We guarantee your roof to be maintenance free for 7 years, from the date of completion. If there are any leaks or defects in our workmanship on your roof for 7 years, DFQ will fix it free of charge. This is our promise to you, so go ahead and give us a call for a free no hassle estimate. Unless specified otherwise in the contract. We are a trusted and well respected roofing company. In addition to the thousands of successfully completed residential and commercial roofing projects, see here, we were voted 2015 & 2016 best roofing contractor. Our skilled and courteous roofers provide quality roof maintenance, repairs, and replacement in the entire DFW area and the surrounding communities. DFW Best Roofing is licensed, bonded, and insured. We have received more then 200 handwritten reviews. We have highly trained professionals who are ready to help with your residential or commercial roofing needs. *Have a leaky roof? Our team of professionals can help to assess the damage, determine the cause, and make the necessary repairs to ensure that your home or business is dry and protected. *Not sure if you need a new roof? Our roofing experts can do a thorough inspection and advise you of your options. 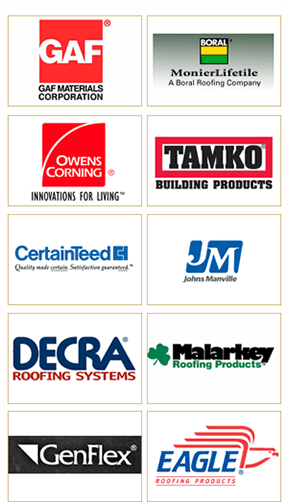 *Unsure what roofing products are best for your project? Our knowledgeable staff can provide you with information on the products that are available, the durability and quality of the products, and the warranties that are available for each product in order to assist you with your decision. *Are your gutters in disrepair? We can clean, repair, or replace your gutters and downspouts so that your home is properly protected from rainwater and melting ice. *Need an emergency repair? Call our 24 hour emergency service and help will be on its way. Our roofing installations are backed by a warranty. We want you to feel secure in knowing that your home or business has a watertight roof that will protect your valuable property from the elements. All of our estimates are done by our owner or roofer who owns a part of the company. We are an Employee owned company. No salesman will visit your home or business. The owner or an employee roofer who owns part of the company, and brings more than 30 years of experience to the job. He will give you a fair estimate and share his knowledge about roofing so that you can make an informed decision about your roofing needs. We offer all of our customers financing options with 0% interest. We will work with you to help you get financing that makes sense for you. We are prepared to help you with all of your roofing needs . This includes roof inspections, roof repairs, new roof installation, roof “tune-ups”, waterproofing, gutter guard/gutter helmet installation, gutter repairs, gutter replacement, gutter cleaning, sidewalls, soffit and fascia repair or replacement. We specialize in metal roof restoration. DFW Best Roofing has been working on metal roofs for over 30 years. We have the knowledge and skills needed to work with metal and the specialized equipment needed. We can bring your metal roof back to life using the best suppliers. We work Henry, Gerard, Decra, Mueller, Mc Elroy, and others. Your roof will look as good as the day it was first installed! We have provided thousands of residential properties with quality roof work. 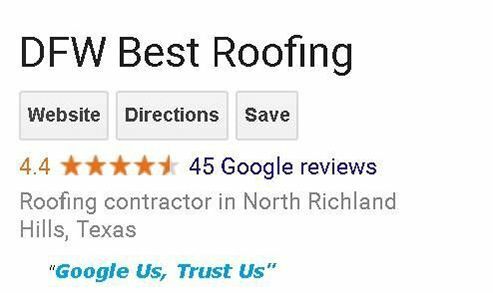 With more than 10 years of experience, in the Dallas Forth Area, our customers know to expect the best roofing work available. We can assess your current roof and make any repairs needed to extend the life of your roof, or we can provide you with affordable, attractive options for new roofing materials if your roof needs to be replaced. We back up all of our roofing work with a company warranty in addition to the manufacturer’s warranty so that you can be confident that your roof will last. We have completed hundreds of commercial roofing projects. Our knowledgeable professionals have installed and repaired all types and styles of commercial roofing. We use top quality materials installed to the manufacturer’s specifications for a roof that will last. We can inspect your roof and provide you with options for upkeep of your current roof, or help you select a long-lasting new roofing material as needed. We install all types of roofing. We are experienced with metal, slate, shingles, roof coatings, aluminum coating, elastomeric coating, flat top roofs, modified bitumen, EDPM, TPO, and Modified Systems, shakes, green roofing, composition, gravel, and clay and concrete tile. We also install all styles of skylights, solar energy systems, and wind turbines. If you don’t see a roofing option listed that you are interested in, contact us. With more than 10 years of roofing, we have experience with all types of roofing materials. We will be happy to discuss your options and provide you with full product information, including the pros and cons of each so that you can decide what will work best for your needs and your budget. Whole House Additions to your Exterior, including Family Room Additions. We’re not just a roofing contractor. We are general contractors that can help you with all your home improvement needs. Our expertise covers all aspects of home repairs and renovations. We can assist you with everything from painting, siding and windows to kitchen and bathroom remodeling. We offer window and siding replacement, electrical and plumbing repair and replacement, interior and exterior painting, concrete repair, drywall repair, flooring repair and installation, door repair and installation, kitchen and bath renovations, and total home renovations. We have helped hundreds of homeowners, businesses, & apartment complexes, protect their valuable properties by providing a solid, watertight roofing system. We have courteous, dependable, expert roofers available to assist you with all your roofing needs, whether you need a simple repair or a whole roof replacement. All of our roofing projects are backed by our own warranty. Our owners, will be happy to assist you with your estimate and your decision. We are proud to serve you with all your roofing needs. "There's nothing more important than having a roof over your head. And there's nothing more important than picking the right roofing company to make sure your roof is installed correctly and maintained properly." We like to call it “Our Kitchen Table Down To Earth Talk". Our friendly staff will schedule a time to meet with you in a personal and neighborly way. It starts with a thorough inspection of your roof. During the appointment, the roofer will take measurements and collect all documentation required to build your estimate. They will also take the time to review their findings with you and answer any questions you may have about your project and your insurance paperwork. Product brochures and samples are give to you. You are given addresses of many jobs right in your neighborhood. The facts you should know when replacing or maintaining your roof. Details in plain English and a cost break down with at least two options . No pressure informative meeting to discuss product options. You will be given recommendations on what type of work is needed and the steps to complete the work. You will be shown a range of available materials from leading manufacturers that fit your budget. Additional options are explored, such as skylights, gutters, insulation, ventilation and much more. You'll be pleased to discover that we offer many affordable options both in style and color, enhancing the value and appearance of your home. We give you all the facts and the costs and what to expect right up front. Based on the materials you select, you will receive a FREE comprehensive written estimate that spells out all the details involved - no surprises later. If you choose to accept our proposal, materials will be ordered and a date set for them to be delivered to your house. Our own supervised, professionally trained crews deliver top quality craftsmanship for every detail of your job. We never use sub-contractors. We do a final walk through, give you the certificate of completion and your warranty. We also ask for referrals and a review on the internet. Once the materials are dropped, work will begin. The time needed to complete your project will be determined by the size and scope of the job. Upon completion, a final inspection will be completed by your estimator and you will be given a customer satisfaction form to fill out, so we can be sure we are meeting all of your expectations. A new roof may seem like a hefty expense, but it will actually be saving you money in the long run. A lot of homeowners don't understand how this is possible, but think of how much money you spend each year on repairs for your roof to keep it from leaking or causing damage to other areas of the home. If you have noticed that you have to call in for repair after repair, it may be time to think about roof replacement. It's a one time expense that will save you from having to pay to get damage repaired all the time. Also, it can help to boost the re-sale value of your family's home. Also, if anything major was to happen your insurance may not pay if they conclude that it was neglect. In addition to replacing roofs, we can also help you with roof repair. If you have a section of your roof that has been damaged by wind, storms, or from animals, we can help. We can offer everything from shingle repair and replacement, to taking care of damaged panels that are underneath the roofing material. We show up on time for your appointment, and we will come prepared with all the materials and tools that we may need for the job. We will also clean up the job site when we are finished so that you don't need to worry about doing this work on your own. We can replace just a few shingles, a section of your roof that has been damaged, or we can even replace the entire roof if necessary. We can match existing shingles with new shingles, and we can provide you with a variety of roofing materials to help with keeping the top of your home safe and protected from the elements. DFW Best Roofing is a family-owned and employee owned business. We offer a wide variety of exterior services for your home or business including roofing, gutters, spouts, siding, skylights, and shutter services. If you’ve been hit by a recent storm or have suffered wind damage, give us a call. We’ll work you through the insurance process step-by-step and even file the billing for you. We pride ourselves on professional, honest, and high-quality work. Contact us today for a free estimate.